I've lived in my home for 15 years now. I've seen a lot of mailmen come and go in that time. One told me our route was the one they use to torture new mailmen with, because it's long, difficult and filled with dogs. Another mailman quit our route after being viciously mauled by a dog, in fact. He was the mailman that used to break the rules a little with my tarot packages from overseas, because he knew I lived to receive them. I think each mailman plots their own route, because I've received mail at 8am from one mailman, noon from another and 9pm from another. Yeah. 9pm. The mailman we have now delivers around 2pm or so. I really couldn't say for sure because he's a magic, invisible mailman. 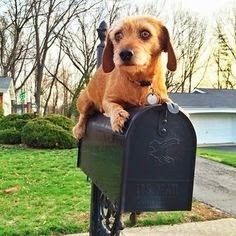 In all the 15 years I've lived here, he's the only mailman capable of eluding the dogs EVERY SINGLE DAY. This is made even more difficult because I recently got a new mailbox that opens loudly and doesn't close very easily. But he somehow manages to open it without a squeak and close it without sound. Either that, or he teleports the mail into the mailbox from the curb. I wouldn't know because I've never managed to catch the guy in action myself. It's easy to underestimate the value of the service this man provides, not in delivering the mail, but in delivering it without waking the beasts. It seems to have gotten to the point that they don't even hang out by the window anymore, because they perceive there are no longer any threats to the perimeter. Either that or, since they have no idea when he comes, they're too lazy to sit there all day and figure it out. There is a quote out there somewhere that says something about how any job can be elevated to an art when you do it well. The real quote is pithier, but the little bit of extra service this man performs by being stealthy every day is this man's art. Maybe he does it because it's scary to have dogs flailing themselves against a large plate of glass standing between him and certain dismemberment, but I like to think he does it because this is his art. This is how he turns his everyday, same-route-as-yesterday drudgery into something beautiful that he can be proud of. Regardless, he's a master at it. And his efforts are appreciated. There's doing a job, which is basically performing the tasks you're expected to perform. There's doing a job well, which is going above and beyond to be one of the best at what you do. And then there's doing a job magically, which is a whole other dimension that doesn't necessarily mean you're technically one of the best, but it does mean you're a star. There's a woman named Dee that locals may know. She works at the Variety Store. She used to work at the Hollin Hall bakery and, at before that, the natural foods store in that shopping center behind the Krispy Kreme. She stood out at the natural foods store because her vest was covered in "Jesus Saves" and "Have a nice day!" buttons. When they went out of business, so did her vest. She can't wear the buttons at the Variety Store. I don't share her beliefs, but I would sign a petition to let her wear her vest again. Her bubbly personality becomes even more entertaining in that vest. Regardless, it feels good to be around Dee. She has a happy outlook on life. I often hear people talk about her beautiful singing voice. She performs in local churches. I think Dee just sees life as both service and celebration. There may be more knowledgeable people at that Variety Store, but none of them shine as brightly as Dee in my opinion. She makes her everyday job magic. When I think of myself, I think I do my job well. My clients think I'm really good at what I do, and there are times circumstances allow me to appear to be magic, but my magic doesn't happen every day the way it does with Dee and my mailman. My "magic" usually manifests when clients don't know what they want and just hope I figure it out. So my ability to intuit needs is the little added bit that I try to do whenever possible. But thinking about Dee and my mailman has me wondering about other ways to add value. I've written before about seeing your job as service, but this is beyond that. This is about elevating service to an art. It's a little hard to consider when your job is art to begin with, but it's about elevating the service aspect of your job to an art. What does that mean to you and how do you do it? And do you do your job, do it well or do it magically?